When you are signing up for a binary options trading account, most of the steps don’t take a lot of thought. Putting in your information to register is easy. Some binary options brokers however offer a series of account tiers, and it can be more difficult to choose between them. Your choice generally will impact your trading experience. The more money you deposit when you place your initial deposit, the higher your account tier will be. The result is often more benefits in terms of resources, tools, and superior customer service. How do you decide which account tier to use? Let’s look at one of our favorite brokers, Banc De Binary, for an example. Banc De Binary offers a number of different account types, which you can view here on their website. The account types are labeled Micro Silver Account, Standard Gold Account, Personal Broker Reserved Account, and VIP Lions Club Account. A Micro Silver Account is available to any trader who deposits $250-$2,500. Most new binary options traders will be placing a deposit inside this range. This is the most basic type of account, and gives you access to 24/7 customer service, daily market reviews, and radio market analysis. 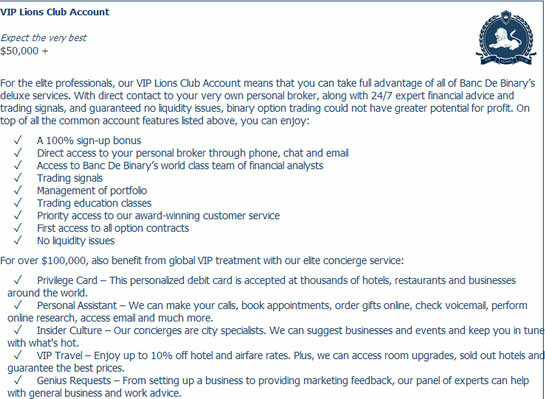 Banc De Binary is exceptional in many ways, and their account tiers are one of those ways. They do not represent a typical menu of options. Not a lot of binary options brokers will even take hefty deposits like $50,000, and generally, account tiers start at lower levels ($250, $500, $1,000, and so forth).